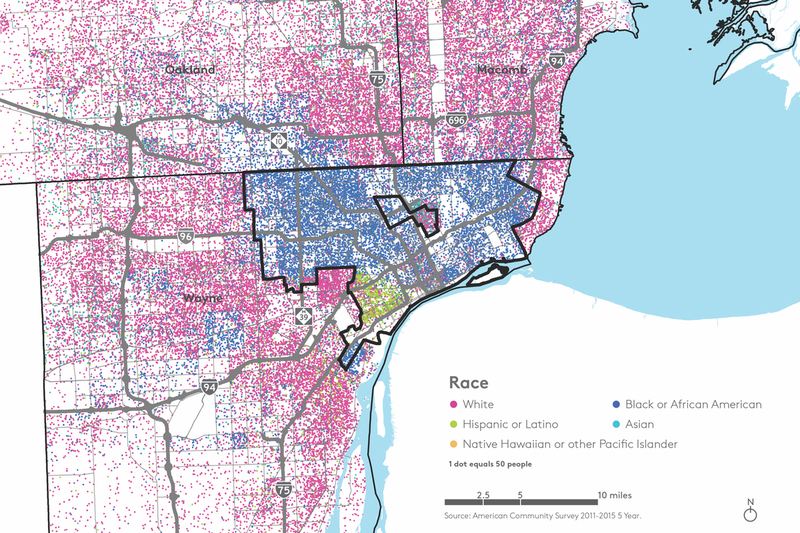 Metro Detroit’s racial segregation is never more startling than when viewed in this sort of presentation, with the heavily African-American city surrounded by mainly white suburbs. Although the steady migration by people of color into surrounding suburbs is also evident, as are the Latino neighborhoods in southwest Detroit. 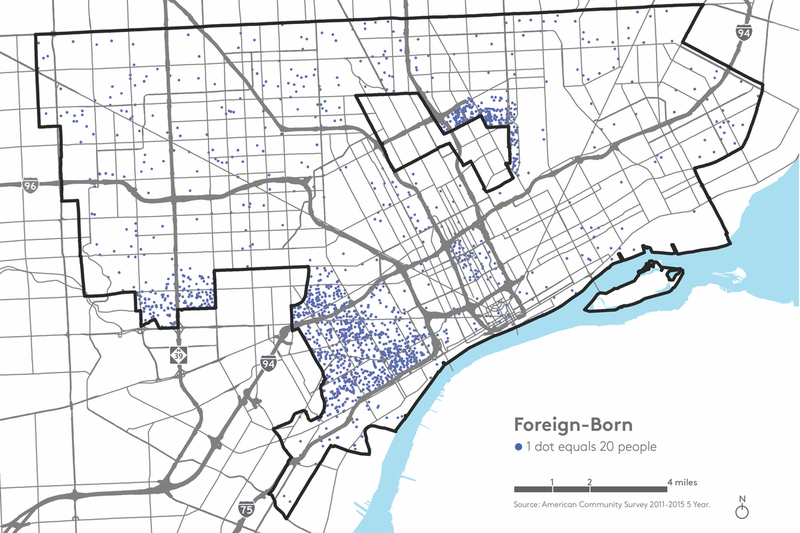 Immigrants in any city often cluster in specific neighborhoods, and Detroit is no exception. The largest number of foreign-born residents are those of Mexican descent in the city’s southwest. The 3,391 Bangladesh-born immigrants are clustered just outside Hamtramck. And farther west are areas favored by Middle Eastern immigrants, adjacent to Dearborn. 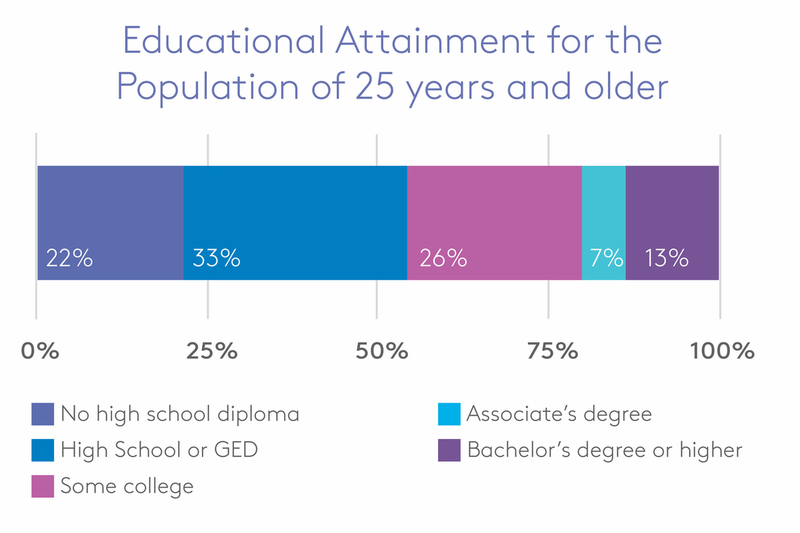 The city’s educational attainment remains low, with 22 percent of residents lacking a high-school diploma, and another third possessing only that credential. 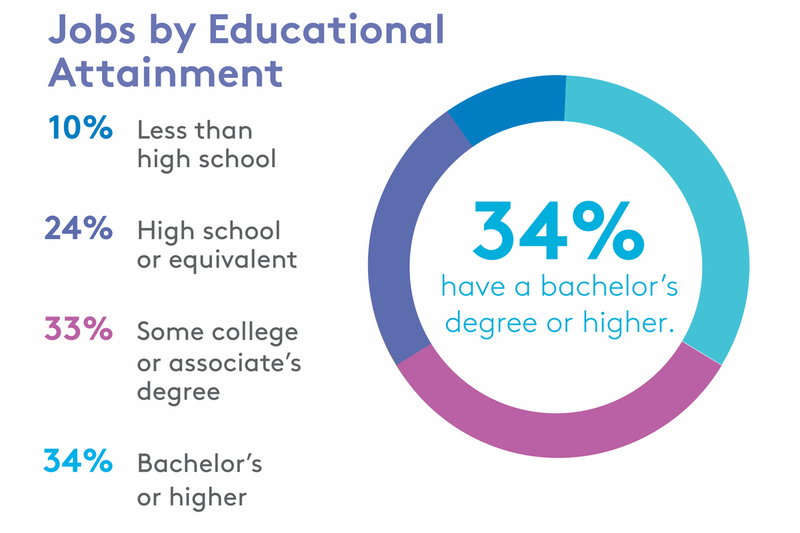 These individuals tend to have a far higher unemployment rate than those with post-secondary education or training. Two-thirds of the jobs in Detroit are held by people with at least some college or a bachelor’s degree. Just 10 percent are available to those with no high-school diploma. 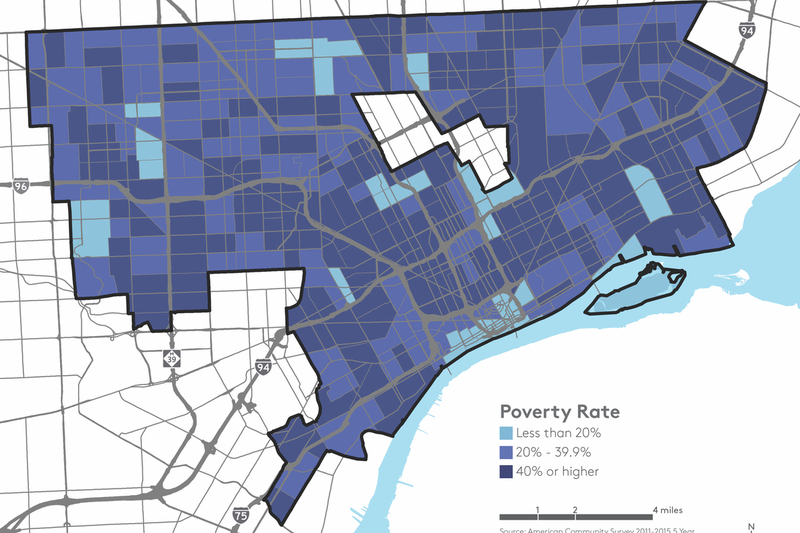 Detroit is a poor city, with a 40 percent poverty rate, including 57 percent of children and 20 percent of seniors. Impoverished neighborhoods are scattered throughout the city, and half of residents are clustered are so-called “concentrated poverty” neighborhoods, where at least 40 percent of residents are impoverished. 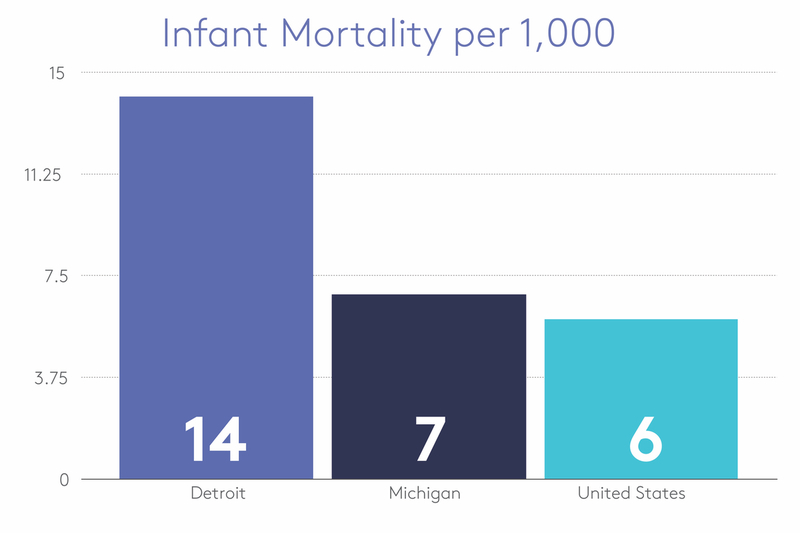 Detroit residents suffer from many health challenges, at all ages, but some areas stand out, including infant mortality, with a rate double that of Michigan and the United States. The city’s rate of HIV infections is also far higher than the state and country as a whole. Only about 30 percent of employed Detroit residents work in the city. Of those who commute to Detroit from the suburbs, 59 percent have jobs that pay more than $40,000 per year. And 36 percent of Detroiters who must leave the city for work have jobs that pay less than $15,000 per year. In a city with an 80 percent African-American population majority, black business ownership remains staggeringly low, 2 percent of businesses with at least two employees. The same is true for Hispanic or Latino-owned firms. 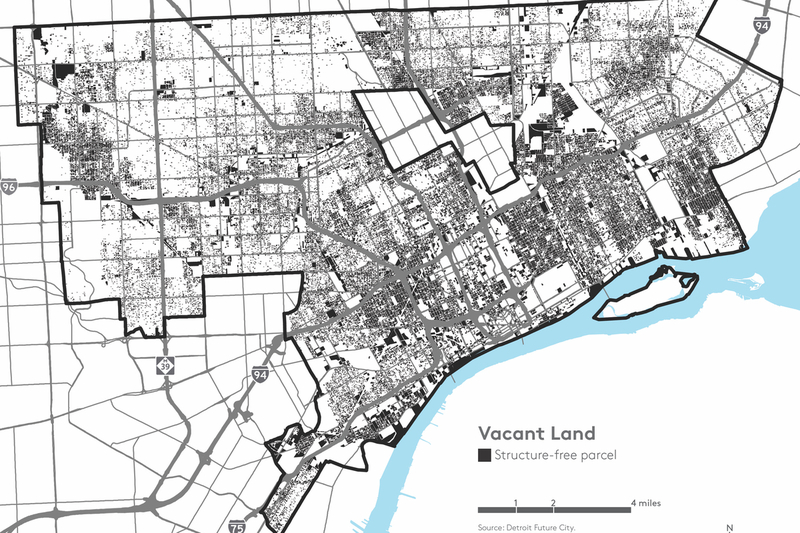 More than 24 of Detroit’s 139 square miles are vacant, not including parks, representing more than 120,000 parcels that once had business or residential structures on them. This vacancy can be seen most vividly in the farther-flung outer areas. 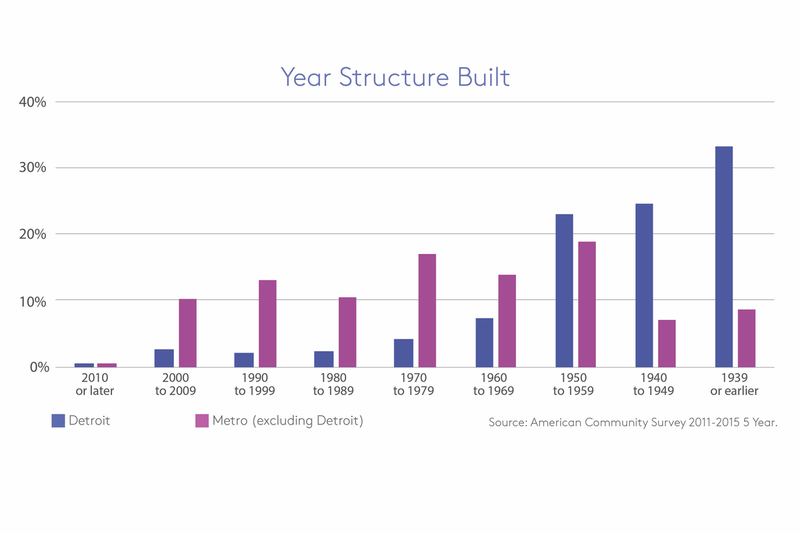 Detroit’s housing stock is old compared to the Metro area, reflecting its period of rapid growth in the early 20th century. After 1960, the suburbs begin to outpace the city they surround. 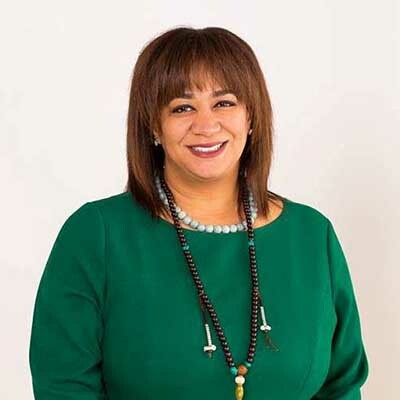 Anika Goss-Foster is executive director of Detroit Future City. At first glance, “139 Square Miles,” a new book-length report by the strategic planning organization Detroit Future City, looks like a data lover’s dream, the story of Michigan’s largest city told in 75 pages of charts, graphs and tables. But to Anika Goss-Foster, executive director of Detroit Future City, read beginning to end, “139 Square Miles” tells a story about the city. A story where the overall population is still in decline, but the number of white residents is growing. Where the graduation rate from local public schools is 78 percent, and educational attainment beyond high school is still disappointingly low. Where 672,795 souls live, 80 percent of them African American, 37,107 of them foreign-born. Where 57 percent of children live in poverty. Not exactly a novel, but with humanity in every number. Particularly worrisome for Goss-Foster: Nearly a quarter of Metro Detroit households have incomes above $100,000, but only 6 percent of Detroit households do. Nearly half of Detroit households earn less than $25,000 per year, but only 25 percent of Metro households earn that little. “The U.S. is losing its middle class, and so is Detroit,” Goss-Foster said. “If what we want to do is advance Detroit, and make it a place where families can grow, thrive and raise children, we need to do better” by middle-income earners. Also worrisome: The lack of jobs. Just 30 percent of employed Detroiters work in the city. And in the overwhelmingly African-American city, just 2 percent of firms with at least two employees are owned by African-Americans. There are bright spots, too, though – neighborhoods are stabilizing after the upheaval of depopulation and wide-scale abandonment brought on by the financial crisis. The central city is seeing new residential building permits, mainly multifamily units. But housing affordability, even in lower-income areas, is still an issue, Goss-Foster added. The John S. and James L. Knight Foundation was the primary funder of “139 Square Miles,” Goss-Foster said, and intended it to be a partner volume to the far larger Strategic Framework report of Detroit Future City, released in 2013. The new report, she said, provides a common data set that nonprofits and others can use, going forward, for planning and comparison purposes. Residents and others may simply find it interesting. Hope to see Detroit rise. Given the climate of our state, it will be a battle. Racism and political division work against everything Detroit does to improve. Mary- The narrative of racism and political division is getting tiresome. People make choices in life. We have seen 4-5 decades of "comfortable poverty' ravage residential Detroit. Residential Detroit will only improve with getting back to the basics of family (having children in marriage when parents are settled financially), attaining education and contributing to society. "A story where the overall population is still in decline, but the number of white residents is growing. And in the overwhelmingly African-American city, just 2 percent of firms with at least two employees are owned by African-Americans." Is there any particular reason why people are still fixated on race? I was under the impression that we as a society have moved past that? The figures themselves show that we have not. Race is highly correlated with poverty, with education, with unemployment, and more. Unless we collect figures by race, we will not know these basic facts, and will not be able to do anything to change them. . I was hoping that someone from The Bridge would address this question, since I see this topic brought up very often. And since they do read these comments and approve of them before anyone else can see them, they cannot claim to be unaware of my question. On a somewhat related note, Michigan Observer cited papers done by Thomas Schelling on another thread on this topic. He suggested that individual choice has more to do with outcomes, which might not be what was expected nor intended. FYI, the post with the Schelling links was from me. I appreciate this Data. Sounds like Gentrification to me. Does DFC have any suggestions to improve the lives of impoverished minorities in the city of Detroit? Sorry Detroit but you reap what you sow. Sow murder, robbery, burning, shooting, rioting and you reap today's Detroit. So why are Muslim's and people of Middle Eastern origin excluded? Seems like a huge omission in a region that is home to so many. I suppose "Asian" includes some, and those of Indian, Bangladeshi and Pakistani origin, among others. The complete story needs to be told- hopefully the new US Census will bring more answers.